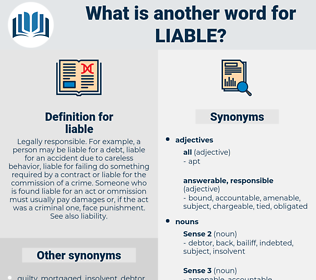 What is another word for liable? Legally responsible. For example, a person may be liable for a debt, liable for an accident due to careless behavior, liable for failing do something required by a contract or liable for the commission of a crime. Someone who is found liable for an act or ommission must usually pay damages or, if the act was a criminal one, face punishment. See also liability. 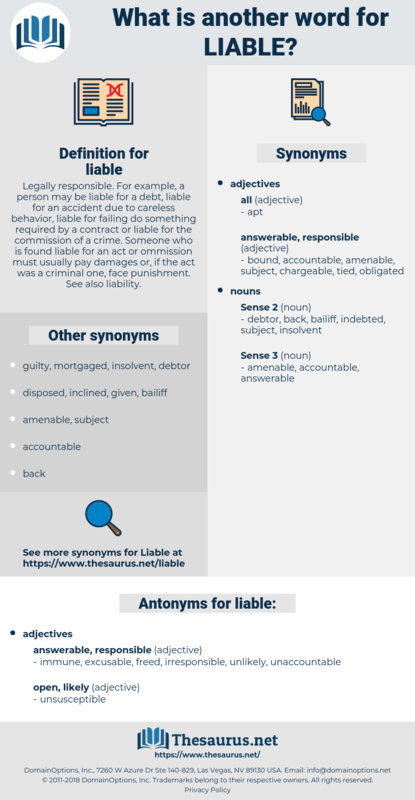 highest, obliged, beholden, able, payable, vulnerable, indebted, prone, attributable, applicable, culpable, obligated, amenable, countervailable, probable, held, duty-bound, available, Prosecutable, possible, convicted, potential, committed, irresponsible, inclined, responsive, conducive, apt, law-breaking, taxable, Sentenced. supervisors, Administrators, chiefs, Trustees, makers, managers. Contributed, charged, suspected, Brought, entrusted, Caused, Meant, Accounted, held, committed, led. contributing, Authorizing, Delivering, offending, dealing, performing, Carrying, conducting, Manning, running. immune, excusable, freed, irresponsible, unlikely, unaccountable. incredible, unreasonable, dubious, safeguarded, insusceptible, protected, doubtful, secured, sheltered, shielded, questionable, guarded, improbable, unexposed, covered. According to past history, another such great battle is not liable to occur for another generation. Yes, something will happen him, and you take it from me, it will happen here or there, and it's more liable to happen here than there. level, lawfully, low blow, lobule, liveable, lapful, loveable, lovely, lawful, love apple, loblolly, lovell, lowball, lovable, livable, labile, lapel, lively, low-level, loophole, libel, lobelia, label, labial, lappula.